These Tech 3 Boots offer impressive performance, safety and comfort at an affordable price, all thanks to the brand new design. 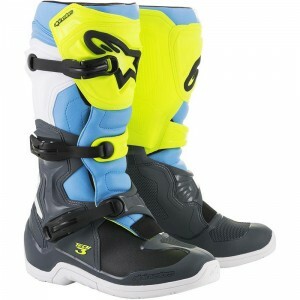 The Tech 3 is a low-price extension to Alpinestars already impressive range of motocross boots. The cheapest motocross boots model from the Italian manufacturer is packed with technical features that help motocross riders perform. The most important technical features are explained below. The medial side has a flat design to prevent you from catching on somewhere. It is also equipped with a grip pattern so that you have a lot of control over the dirt bike. The inside also has some great features that improve performance. For example, moisture-wicking is used in many areas. In addition, the entire inside is covered with a foam layer for maximum comfort, even on long rides. 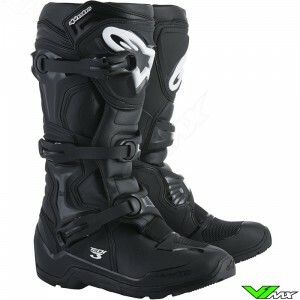 Motocross boots must be rigid to protect riders, but at the same time offer flexibility for maximum freedom of movement and control over the bike. 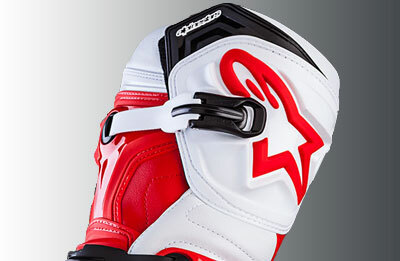 Alpinestars solved this by integrating a sliding blade system into the design. The bio mechanical blade system gives ta wide range of flexibility and dampens movement if they go too far. 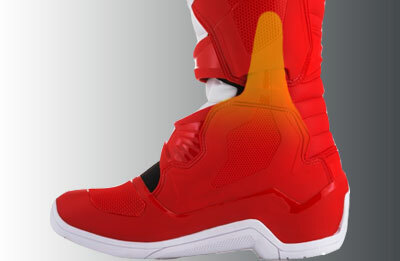 This is how the these motocross boots protect riders against hyper extension. 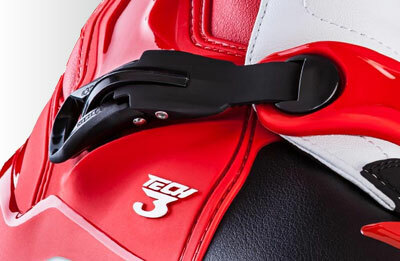 The buckles are based on the design of the Tech 10. This design offers an easy-to-use closure through the self-aligning design with memory. It is important to wear the right size which fits well around your foot. 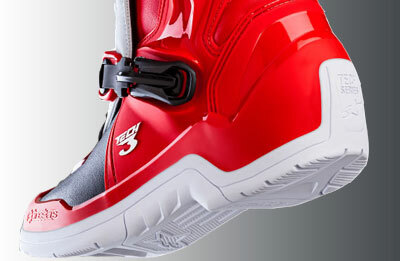 The Tech 3 is available in a wide range of boot sizes, from size 38 to size 52. If you didn’t order the right size you can easily return in. We use a 30-day period for returns, to make sure you have enough time to decide. Protection against impacts from stones and branches is very important in motocross and enduro racing. 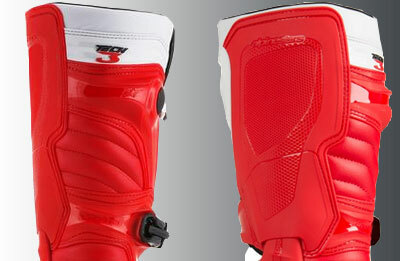 Alpinestars therefore equipped the Tech 3 with TPU protection plates at the shin, nose area and heel. The TPU protection plates are made in an anatomical shape so that the forces of an impact are optimally distributed. 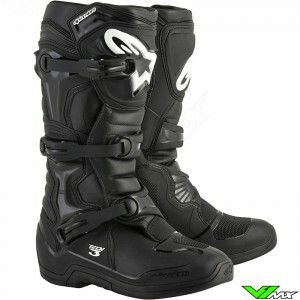 By looking at smart solutions, the Tech 3 has become a cheap motocross boot that does not compromise on protection. When designing the Tech 3, Alpinestars has taking into account that a lot of novice riders will use it. That is why the nose piece is lowered, making it easier to get your foot under the shift pedal. The toe area is made of a wear-resistant material with a grip pattern for extra control over the shift pedal. The TPU material protects riders against impacts. 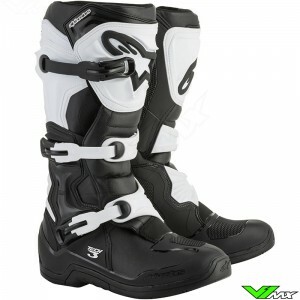 Also, the heel section of these Alpinestars motocross boots are increased in height which promotes an aggressive stance on the bike. The specially designed soles of the Tech 3 motocross boots offer a lot of grip on the foot pegs due to the unique grip pattern and material compound. For enduro riders there is also version available with extra grip, the Tech 3 enduro. The sole of the enduro version has large groves which allow you to push the bike if necessary. 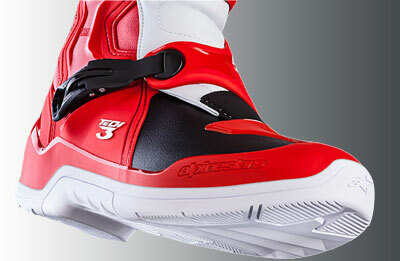 To reduce fatigue Alpinestars has built excellent shock absorption in the sole. In addition, there is an ergonomic foam layer on the inside that promotes comfort and shock absorption. 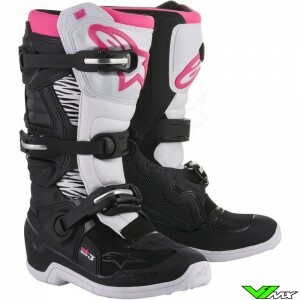 For ladies Alpinestars has introduces a Stella version of the Tech 3. This is designed for the body proportions of women and will therefore offer a better fit than the version for men. This cheap motocross boot is also available in a youth version. The Tech 3s can be viewed an ordered in the kids motocross boots section of the webshop. In the youth section you will find a wide range of motocross gear for children. 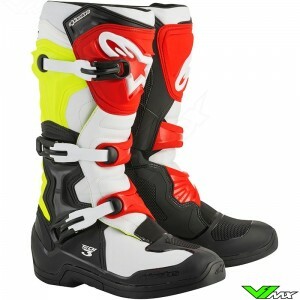 Do you want to buy a new pair of motocross boots, but still have a question about the product or placing an order? Feel free to contact V1mx. We have knowledge of the products and will be happy to help you choose the right motocross gear. You can reach us 24 hours a day via e-mail, we try to answer your questions as quickly as possible.